Do not bother to preheat your oven to 400° or mess with the rest of this process, BUT you may be able to prevent making the same mistakes. Lay bacon on sheet pan and bake in oven for about 12 minutes or until crisp. Meanwhile chop the peeled and seeded cucumber and place it in a pitcher or blender with the lemon juice. If using a pitcher, use a hand mixer to macerate the cucumber into a fine pulp. Remove cooked bacon and drain on paper towels. Place the tomato halves, jalapeno and onion on the sheet pan with bacon drippings. Bake for 25 minutes. Remove cooked vegetables and let cool. Remove the tomato skins and discard. Place the tomatoes, onion, and 1 tablespoon of the jalapeno in the pitcher or blender and mix until no more mixing can be done. Add 12 ounces of tomato juice and blend well. Cool in the refrigerator for at least an hour. Serve in chilled, iced glasses. 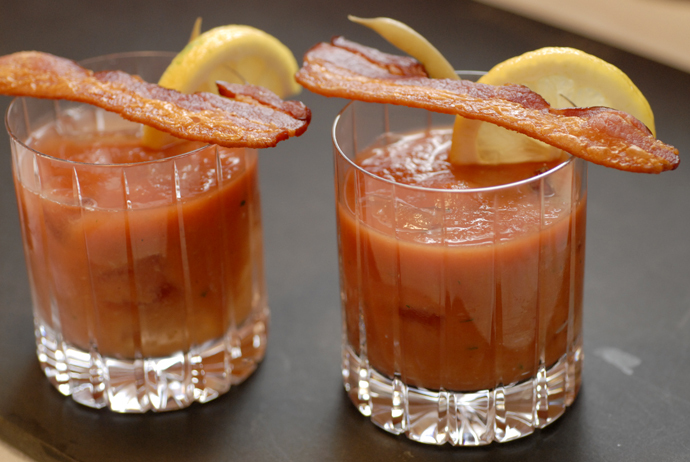 Garnish with a lemon wedge and bacon. The sad part was this wasn’t much more interesting than a spicy V8 mix. It was a little more complex in flavors, but unfortunately not different enough to really justify the time and mess. We vote thumbs down on this one – SO, if anyone has a really great Bloody Mary recipe (even w/o bacon 😉 ) please let us know!! This entry was posted in beverages, recipes and tagged alcohol, bacon, baked, beverage, bloody mary, cocktail, cooking, drink, food, lemon, oven, party, recipe, refreshing, roast by MixedSoup. Bookmark the permalink.